Italjet Moto based in Bologna, Italy as this week unveiled a new Italian vintage moped that takes the form of the ITALJET Motoleggera electric bike, and will be Italjet’s first electric moped offering 4kW of power. Watch the video below to learn more about the new electric bike which has this week taken to Kickstarter to raise the €60,000 the company requires to take the concept into production. 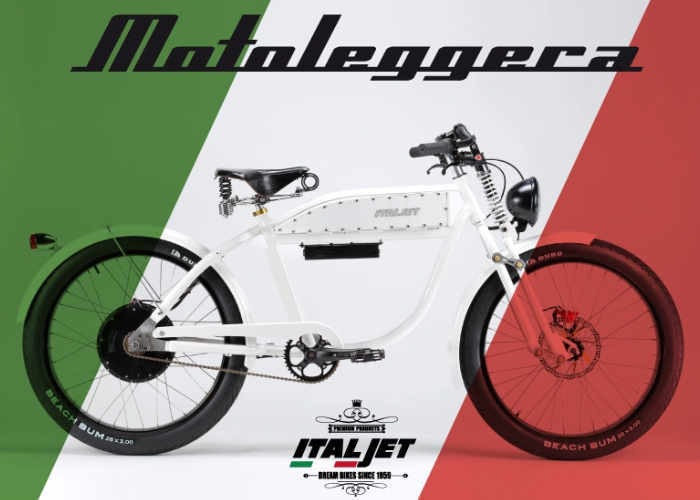 The Italian mean of motoleggera is “light moto”, is going to be Italjet’s first moped – an electric moped! With our great ability to build premium quality ebikes, we started to develop a vehicle that can take you faster and further without compromising the stylishness – Help us built an remarkable vehicle. Do not ever think again about oil changing, filters, spark plugs, belts adjustments, changing clutches or going to gas stations – all those things belong to the past! We need to push forward the electric mobility. With the aim to reduce the carbon footprint and improve the transport struture, particularly in areas where transport is less accessible. We are aware that this category had a big rise lately and stills growing, we think there isn’t nothing of this kind in the market nowadays. An aluminium frame with a trendy suspension, 4kW of peak power with 60km/h of speed and a range up to 70km. Just perfect for your daily commute. For more information jump over to the official Kickstarter campaign page where pledges are available from €4,600 with shipping expected to take place during June 2018. At the current time only a deposit to reserve your electric bike is required costing €1,490.